Maruti Suzuki and its partners have invested approx. Rs 670 crore for development of Big New WagonR. 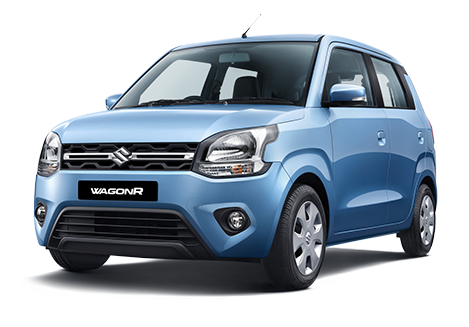 Maruti Suzuki India launched the 3rd generation WagonR today. The Big New WagonR is poised to impress customers with its bold design, enhanced space, comfort, next generation infotainment system and advanced K-series engine offering excellent fuel efficiency and driving pleasure. A true tall boy, the Big New WagonR has a robust body language with a wide stance, which makes it strikingly attractive. 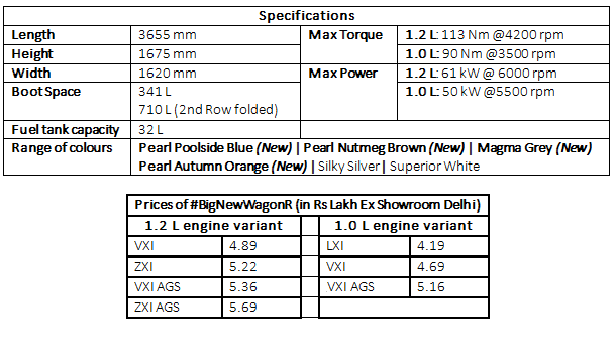 The Big New WagonR is engineered and built on 5th generation HEARTECT platform. The platform increases safety of occupants through effective absorption of impact and dispersion of crash energy and assures stability. Use of 40% high tensile steel provides better strength, safety, rigidity and NVH (noise, vibration, and harshness) performance. In addition to the well proven 1.0 L engine, the Big New WagonR comes with a stronger heart of 1.2 L engine that delivers powerful performance. The Big New WagonR offers excellent fuel efficiency for both the engine options: 21.5 km/l for 1.2 L variant and 22.5 km/l for 1.0 L variant, which is nearly 10% higher than the outgoing model. WagonR promises enhanced safety for its occupants. Use of high tensile steel helps to improve overall safety, rigidity and NVH (noise, vibration, and harshness) performance. Safety features including Driver airbag, ABS (antilock braking system) with EBD (electronic brake force distribution), front seat belts reminder, speed alert system and rear parking sensors are standard across variants. The all-new WagonR meets all applicable regulations including offset, side crash and pedestrian safety norms. For the new generation connected customers, the new WagonR comes with next generation SmartPlay Studio Infotainment system. The SmartPlay Studio is a 17.78 cm touch infotainment system that combines smartphone, vehicle and cloud-based services to offer a delightful driving experience. Its interface is vibrant and customizable. In addition to listening to your favourite music, you can surf news, get the latest weather updates and also locate eateries around you. Since its debut in 1999, WagonR has over 2.2 million happy customers and it’s the first car for nearly half of them. The iconic car from Maruti Suzuki continues to feature among the top 5 best-selling cars in India for nearly two decades.